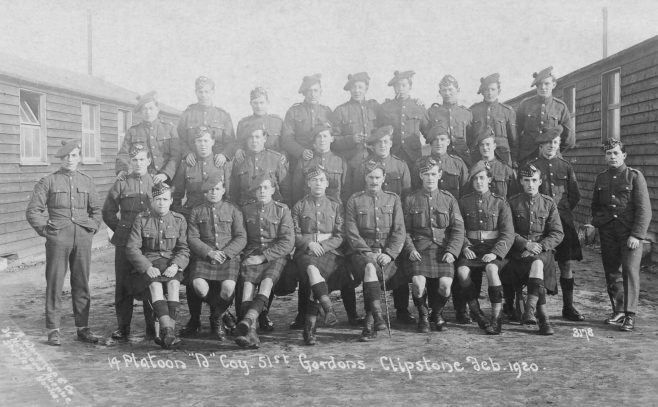 ‘Almost the last battalion of our soldier visitors has been the 51st Gordon Highlanders, and the brawny lads from the North in their picturesque kilts have been very welcome in our town. Demobilisation, however is proceeding rapidly and in a very short time all will be away to their own country. Good Luck to them they have made many friends here, and in the various entertainments, dances, etc., have carried on the traditions of the Gay Gordons. The have produced in the last weeks of their Army life a brief, racy history of the battalion during the eventful years 1914-1920. profusely illustrated with photographs etc., It has been thought that copies might be desired by their civilian friends in Mansfield, and to this end the brochure has been placed on sale with F Willman, White Hart Street, to whom was entrusted the printing of the work. The price is 2s 6d per copy.